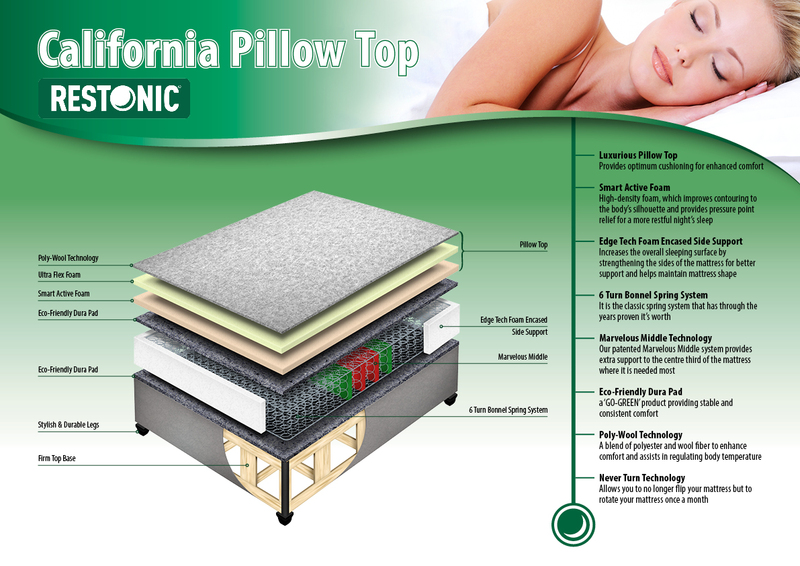 The Restonic - California Medium Pillow Top is great for those wanting durability, quality and good support with a medium feel at a very reasonable price. Considering all the features that this pillow top has, it's sure to prove a great buy for the price since it will provide reliable performance and superior sleep comfort for many years. Pillow Top - A pillow top provides optimum cushioning for enhanced comfort. Ultra Flex Foam - Provides premium comfort, support and durability to the mattress. Smart Active Foam with Airzone - High density foam, which improves contouring to the body's silhouette and provides pressure point relief for a more restful night's sleep.